We believe in using the highest quality products and equipment when designing an audio visual solution that works for you. Here are just a few of the products we use and recommend based on our experience in design and installation. For more information on these products and others click here! Mix cameras, video, computer sources, and graphics--and now, create your own custom visuals and titles. Add virtual sets, recording, streaming, and more. 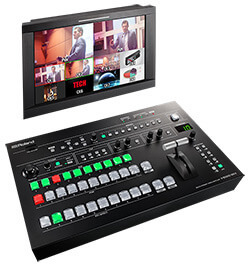 With the Roland series of products, you can easily create your own av equipment system and production videos in HD and for the web with the easy to use interface and all-in-one video studio. Present, annotate and collaborate on a giant tablet with meeting participants in the room and around the world. 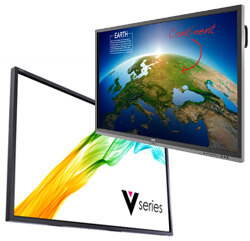 An interactive flat screen puts everything you need to visually present, capture and share ideas at your fingertips – all beautifully integrated into a single device. It's a perfect complement to your audio visual system. 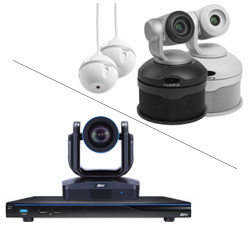 Ideal for medium conference spaces, the ConferenceSHOT AV integrates a 10X zoom PTZ camera and audio conferencing mixer into a single USB 3.0 device, so you can easily connect microphone and external speaker to the camera. The EVC310 is perfect for large rooms in main offices, allowing you to connect with up to 4 parties, all in HD. Integrate with other VC systems, mobile and/or desktop solutions with or without cloud service subscriptions. 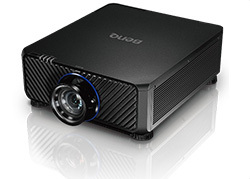 The new Eiki and BenQ projectors are geared up for simple and user-friendly functionality in any environment. Whether it be DLP or LCD projectors, they offer a convenient motorized lens shift, and a 360° vertical tilt angle, images can be seamlessly adjusted and moved at the touch of a button. 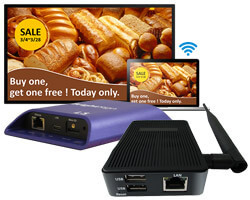 Plus, with a wide range of optional lenses, the projectors can adapt to any environment and give you full HDMI connectivity as well as an optional wireless network connection, giving you the freedom and flexibility you need. 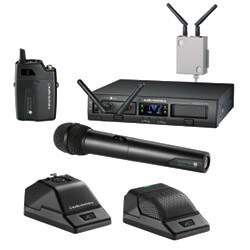 Audio-Technica’s System 10 PRO Rack-Mount digital wireless system provides the same interference-free operation in the 2.4 GHz range (outside TV bands) as the original System 10 wireless system but with expanded features and versatility. The durable half-rack chassis is equipped to house two receiver units that can be operated locally or released from the chassis and mounted remotely (up to 328 feet away) via Ethernet cable. 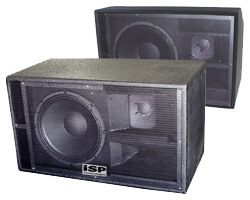 Not quite a portable sound system, the active loud speakers are the new standard in lightweight powered loudspeaker systems. Under the direction of Pat Quilter, the team of amplifier engineers have created a new standard in Class D power modules unparalleled in the industry. Next, breaking from the traditional loudspeaker paradigm, every model is fitted with the identical 1.75" HF device (fullrange models) and woofers of the same high quality for unparalleled performance, regardless of speaker size. Easy-to-use equipment and creation tools for building multi-screen video walls, digital signs and kisosks. Choose from a range of products from Brightsign, iadea and X-sign. Our equipment installations can be seen around Central Oregon, including at the Riverhouse Convention Center and Current Restaurant and meeting Center, Deschutes National Forest Visitors Center, McNary Lock and Dam Visitors Theater, Pacific NW Audiology, Worthy Brewing,and Oxford Suites Hotels. Click here to read our Cascade Business News article! "I want to thank you and your staff for all the hard work you have demonstrated in the last few years. Looking forward to doing business with you again. You are awesome." - Shally Hartman, Portland Community College-Sylvania Campus.